Dorah has just undergone a corneal graft operation on her right eye. This was needed because her own cornea was severely damaged during the fire in which she received her terrible injuries. The cornea was clouded to the extent that it was not possible for Dorah to see through. Her lens had also been damaged and had to be removed. Bronwen Jones has written an article about the corneal graft operation and this will appear in The Times newspaper shortly. After the publication of the article, the full text will appear on this website. What follows is a brief explanation of the corneal graft operation and some statistics relating to corneal grafting in the UK. 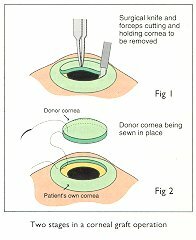 2216 corneas were transplanted in the UK in 1998. This was a decrease of 4% relative to 1997; this year there is an increase of about 6% so far. There are approx 200 corneal graft centres in the UK. The total waiting list is unknown since only those with special medical needs, 424 patients (31 Dec 98), are recorded centrally. There are 3 major eye banks with many opthalmic units having their own local bank. Most corneal donors are patients who have died, due to cancer, in a hospice. Very occasionally live donation is possible. This is when an eye has to be removed to urgently treat a living patient; there were 4 such donations in 1997 and none in 1998. Where tissue matching is a requirement then corneas will be retrieved from kidney donors who are routinely tissue typed. Sometimes the Eye Banks make appeals for corneal donations because their stocks are running very low. When one considers that there are probably 300,000 deaths each year where eye retrieval should be possible it highlights the communication/resource difficulties that exist. The cornea is the window at the front of the eye. In a normal eye the cornea is clear. Light is able to enter through the clear cornea, pass through the clear lens to focus on the retina at the back of the eye. When the cornea is deformed or damaged from injury or disease light cannot pass freely to the retina. 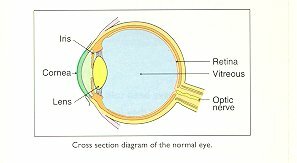 The picture that the retina passes to the brain is not clear and sight becomes distorted or patchy. A corneal graft operation involves the removal of part of the damaged cornea and its replacement with a similar piece from a donor eye. These donor eyes are ones which have been removed from a person who has died. The individual or their family consent to the use of the eye for medicla purposes after their death. The stitches that hold the corneal graft in position are normally left in place for at least a year after the operation. In Dorah's case, they will probably never be removed. Acknowledgements: The trust would like to thank John Evans for the statistical information. Thanks also go to Moorfields Eye Hospital, London, who own the copyright of the above images.